When we were in China last month, we spent the last 5 days in Beijing. We had one plein air painting day, and it happened to be a Chinese holiday (the Moon Cake Festival). Trying to avoid the big crowd, I picked a less well know park, the Tao_Ran_Ting park as our painting site. It turned out to be a great choice. We saw most of the local people, not too many tourists in the park. They were doing their morning exercises, ballroom dance, and music instrument and choir practice. It was slight raining in the morning. I found this twin-pavilion with a small lotus pond in the front. The scene is typical Chinese. So I use it to place the end of our wonderful China painting trip of 2013. I forgot to take a photo after I did my second demo on my Springfield workshop. A few days later I received this image from the workshop organizer Susan. I really like this photo. I feel excited because the color scheme of photo is different from the painting. It gives me a new vision of color design for still life paintings. I have not done many paintings with a background so warm. A great new opportunity to me comes. It happened to be quite windy and cold for the days I visited Lancaster. Instead of painting plein air, I did a sketch in Beth's car. The scene was spectacular. The cows and horses were posing for me. The barns and silos provided the variation of shapes on the vast land. Nearby there were a single room school. During the recess time, children were chasing and playing. In contrast to their black dresses, their peach red cheeks and blond hair appears extraordinarily beautiful. I wave my Amish hat (I just got it from the tourist store) to them, but they just stared at me, wondering where this Chinese "English" coming from. I have been back to Austin now. When I was waiting for my flight at the BWI, I did another sketch from a photo. I need ponder more. Is there a way I can have some Amish spirit in my work and life in this high tech driven modern world? 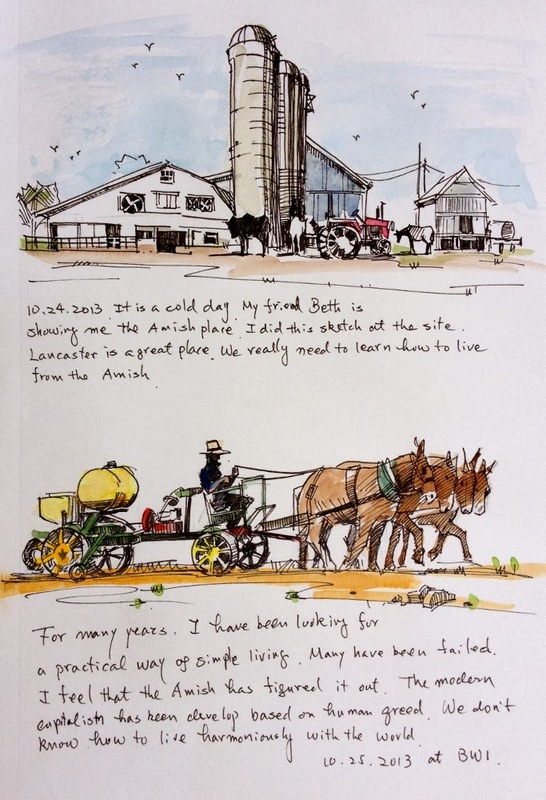 After my Yardley workshop, I have spent 3 days in Lancaster, PA touring the beautiful Amish countryside. A very good friend of mine, Beth Bathe, has been showing me around. I have long for this visit. For a long time I have been think about what kind of living style should be most suitable to me. In my bones, I don't like money, but I want to survive and live comfortably. I read about other people's experiences and tried an experiment of off-grid living in the Texas Hill Country. However, I saw so many failures. The main stream economy has run into problems after problems. I think I am not alone looking for alternatives. 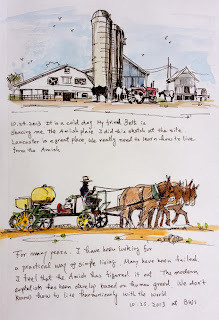 These a few days, I really enjoyed the peaceful, simple, and harmonious life in Lancaster county. I have seen the Amish wisdom toward technology. The way of living of the Amish has a strong impact to me. It has worked, works now, and will work in future. I will not feel surprise if the we run into major disasters, the only people who survive will be the Amish. In Yardley, I stayed at home of the nationally recognized portrait artist John Ennis. It was so wonderful staying with another great artist. John and I discussed art and I have learned a lot from him. This is my second demo at Yardley. I been so busy and not able to get enough time to touch my computer for a several days. My Springfield workshop went very well. After the workshop I stayed with a friend of mine in the Washington DC area for a day. My friend is an art historian. She wants to spend her ENTIRE life writing only ONE book. This book is SO esoteric that only 6 people in the ENTIRE world will have the interest to read it. Although both of us are in art, but the gap between our opinions is 7.85 trillion light years apart. But you know what, we had such phenomenal conversation. We like two aliens from totally different stars, full of curiosity to know the thought of the other species. We don't want to waste any moment for eating and sleeping. After seeing goodbye to my friend, I rented a car driving through Virginia, Maryland, Delaware, and arrived at Yardley Pennsylvania. I taught another 3-day workshop there. I want to thank Susie Morrell and "Artist of Yardley" for organizing this workshop. I want to thank all the attending artists for painting with me. This is my first demo on the workshop (sorry about the photo quality. I lost control sometimes). The night before the workshop, Susie's family invited me to a great restaurant called "Washington Crossing" for dinner. We were right on the Delaware River. That great painting is hanging there, but I don't know who was the artist. Continuing posting my plein air painting in China, this one I did at Yangshuo by the side of the Li River. Yangshuo is a small tourist town. It is very westernized, you see English signs all over. We took another ton of photos here. Be sure to check our photo website. It changes everyday. I am on my way to the Washington DC area tomorrow. I will teach two workshops: one at Springfield VA, and one at Yardley, PA. There are still a couple of opening in my Yardley workshop, please sign up if you are interested in. One of the artists we went to China together, Beth Bathe, has created a website, such that all the China trip members may post their photos on it to share. Now it has loaded with huge amount of wonderful photographs of this trip, and the number of images is increasing everyday. Many of them can be great reference photos for painting projects. If you want see the photos of our trip, please click: Painting in China Photos. I also created a widget for this link on my blog. If you are interested using the photos in the specific albums for painting, please contact the owner of the albums for permission. It is very exciting to share what we have seen with all of you. Time goes by so fast. three quarters of the year has passed. I will be on my way of workshop teaching pretty soon. Having said about workshop teaching, I want remind everybody that Song and I will offer our Austin based painting workshop again at the beautiful Anderson Mill Garden Club on January 7 to 10, 2014. Since I am both the teacher and organizer for this workshop, you may consider this blog post is my official announcement for this workshop. This one will be 4 days. I will cover both still life painting and my recent approaches in landscape painting. Please check Qiang's Austin Workshop for details. Workshop teaching has been the major part of my art business. I have been doing my best to offer an informative, and easy to follow art education. I am so happy to see so many of you come to my workshops, and many took several times. Now my art is improving, and my business is expanding, but as a good problem, I have been led to a point that my one person operation (plus Song's help) has reach a limit. There are still more I should do, but I am simply out of skills, time, and energy to do it. Many friends have been giving me suggestions, but I have not taken any significant actions so far. I really need to learn management skills and team up with other smart people to make the art education more effective and accessible, and gain more time to paint for myself. In order to bring art education and services to a higher level. I am looking for people I can team up with. If you have a proposal in the fields of communication (email) management, website and social media, event planning and travel arrangement, video and online education, business management and entrepreneurship, and other improvement you can think of, please contact me. Your proposal does not need to be formal. A simple email will do. But please let me know how to conduct it, and how do we work together. If your proposal is accepted, you will win a free seat at my January workshop stated above as my sincere appreciation. Then we will work together to make the project you proposed beneficial to everybody who needs art and a win-win for both of us. I put my large painting projects on the back burner, now my today's post is another plein air in Zhouzhuang. This is the third one I did there. My second painting in the village didn't turn out well. On the second day we stayed, we started painting really early, around 6:30 AM. Our jet-lag was advantageous to us this time. It was still very hot and humid, 30 minutes later, we felt we need to take another shower. We picked a very popular sightseeing spot. Well, most beautiful place may not always suitable for painting (my excuse for not being able to paint well that day). In the middle of our painting process, a movie crew came suddenly. The place was packed right away. It was so crowded I couldn't see my scene. So I gave up right there. On the third day, we found a relatively quiet place. Only local villagers are around us, washing their cooking pot and mop in the same water. A group of old ladies was selling dry fish next to me. I felt very well this time, and this painting fell on my panel in a very short time. I was planning to show more plein air paintings I did in China, but I decided today to take a detour. I want to update you what I am doing right now after I returned to the States. Based on tons of photos I took in China, I really want to do a few large paintings. Since I don't have enough skills of painting large landscapes. I want to plan my effort prudently. First of all, I want to put color-mixing aside. The major issue of painting large is the design of my brush works, such that I can maintain the energetic painterly effect as I have been showing on my small paintings. I don't want to deal with the color mixing simultaneously. This painting is my small study before I paint large version. Only black and white were used for it. Like in photography, Black & White approach does have its own charm. I feel I am going back history and arrived at the good old days. You probably have been sick and tired of my sketches by now. It is time to show some paintings. This is my first plein air painting in China. It was the third day after we arrived. Our group have just settled in a very elegant hotel in Zhouzhuang. This is a place you see very few foreign visitors. We were given a map of the village, but it is all in Chinese. I had to explain to all team members where we were, and where we would go. Even this high end hotel did not provide ice water. There was a refrigerator in each room, but its temperature had been set too high so the drinks inside were almost the room temperature. It was a hot and super humid afternoon. After taken my third shower of the day, I set up my Open Box M easel right outside of the hotel. It was considered as a demo, but I had no idea what I was doing. In my semi jet-lag sleep, I started to lay my darks. The perspectives were quite challenging (I thought I knew perspective inside out, WRONG!). There was a cat watching me at the beginning, then she got tired of my art and walked away. A street vendor was frying stinky tofu nearby. Perhaps, we were the only plein air painting group in the village (and it was very international). We had attracted quite an attention. Many local villagers and Chinese tourists took pictures of and with us, (as Mickey and Goofy in the Disney World). So we contributed quite a bit as a new attraction point to the Chinese touring industry. I got some comments on my painting. "You do houses all right, but you just don't know how to paint trees" said one of the tourists. Now the cat was back reminded me it should be the time to call it a day. Many our team members painted as well, and they had done much better jobs than what I did. After about 30 long hours on the way. We are back to Austin this down. Deadly tired. Using my chopped time on the plane and in the airports, I copied more sketches. I have no control on my life, but I will treasure what I have. Two minutes here and two minutes there form my real art education. 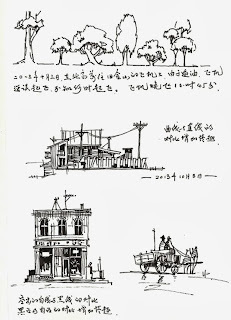 I did more sketches in Beijing. 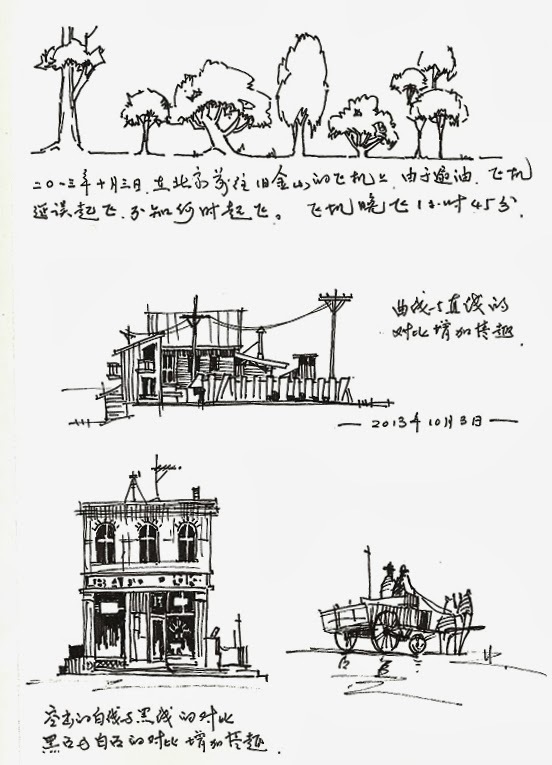 The first one is from a photo I took from Zhouzhuang, and the other one is another copy I did from R. S. Oliver's work. I feel all artists should have adequate drawing skills. sketching is a good exercise and fun activity. Sketching is not only a big help to our paintings, but also a good art form by itself. I will practice this art form for sure.